Over the last two decades, discoveries made in the field of cognitive neuroscience have begun to permeate the humanities and social sciences. In the context of this intersection, Neurofilmology is a research program that arises at the encounter between two models of viewer: the viewer-as-mind (deriving from a cognitive/analytical approach) and the viewer-as-body (typical of the phenomenological/continental approach). Accordingly, Neurofilmology focuses on the viewer-as-organism, by investigating with both empirical and speculative epistemological tools the subject of audiovisual experience, postulated as embodied, embedded, enacted, extended, emerging, affective, and relational. Over the last two decades, discoveries made in the field of cognitive neuroscience have begun to permeate the humanities and social sciences. In the context of this intersection, Neurofilmology is a research program that arises at the encounter between two models of viewer: the viewer-as-mind (deriving from a cognitive/analytical approach), and the viewer-as-body (typical of the phenomenological/continental approach). Accordingly, Neurofilmology focuses on the viewer-as-organism, by investigating with both empirical and speculative epistemological tools the subject of audiovisual experience, postulated as embodied, embedded, enacted, extended, emerging, affective and relational. This introduction is divided into three parts. Firstly, it compares the classic filmological approach of the 1940s-50s with contemporary audiovisual media studies devoted to the analysis of viewer experience. Secondly, it outlines an epistemological and conceptual framework for the research: in this sense, it illustrates the theoretical model of the viewer-as-organism, and sketches a general outline of audiovisual experience that allows researchers to rearrange different kinds of research within a unitary framework. Thirdly, it briefly summarizes the contributions to the special issue. This article offers a critique of neuroaesthetics and neurocinematics. Neuroscientific research aims at a quantitative assessment of the impact of different art and film styles on viewers’ brains through functional magnetic resonance imaging (fMRI) and inter-subject correlation (ISC) analysis. Advocates of neurocinematics, in particular, believe the turn to neuroscience will help film theory go beyond ideological, linguistic and psychoanalytic models, i.e. subject-positioning theories (SLAB theory: Saussure, Lacan, Althusser, Barthes), which draw a pessimistic picture of the subject as “split” and “positioned,” “trapped” both internally (by unconscious forces) and externally (by various ideological discourses, including the film apparatus itself). I argue that by positing a looping effect between the brain and the screen, neurocinematics shows itself to be an extension of apparatus theory, although one rooted in neuroscience rather than in SLAB theory. Furthermore, although “the New Materialism” – of which neuroaesthetics and neurocinematics are two representative instances – positions itself as “post-human” in its commitment to granting the non-human agency and vitality and to acknowledging its affective, ethical and political potential, it covertly carries on some of the assumptions and beliefs fundamental to post-structuralism even as it claims to “de-anthropomorphize” philosophy, aesthetics, and film theory. This article offers a close reading and a critique of Hasson et al.’s Neurocinematics, focusing on its treatment of the notion of control, meaning a predictable neural and cognitive activation triggered by film stimuli. In the first part of the article I suggest that the use of control in neurocinematics on the one hand relies on a similarly problematic – but still more nuanced – use of the notion in cognitive film theory, and on the other hand reflects a unidirectional model of communication which brackets out noisy cases that diverge from predictable behavior. In the second part, I argue that these “noisy” cases are exactly the ones that pertain the most to a complex and dynamic view of brain activity and film-mind communication. The dialogue between film studies and neuroscience can become more complex too, escaping from a problematic definition of film effectiveness with regards to predictable viewer reactions. This essay revisits the question of empathy in film theory by looking at recent neuroscientific findings on affect, emotion and empathy. In film theory there is a classic division between cognitive approaches toward emotional engagement with characters, based on mentalizing or projecting oneself into the situation of another, and phenomenological approaches, based on a more direct embodied experience of mirroring emotional states of characters on screen. Debates in cognitive and affective neuroscience seem to reconfirm these two dominant views on cinematographic engagement: social and cognitive neuroscience demonstrates how we imagine the experience of others in activating the prefrontal and lateral regions of the cortex in projecting a “Theory of Mind.” Affective neuroscientist have demonstrated that the activation of mirror neurons in different parts of the brain, such as the anterior insula, and middle anterior cingulate, effectuate an immediate embodied emotion. Both in film theory and in neuroscientific debates, these two views are often opposed and presented as mutually exclusive. This article elaborates the emerging view that both forms of emotional simulation have their own validity and work together in a dynamic network with varying degrees of dominance according to the type of dramatic situation. The television series Dexter will be considered as a “neuro-image,” an extended and new form of contemporary cinema and will serve as a partner in dialogue in the development of the arguments. The investigation of viewers’ affective experience is one of the most complex and stimulating tasks for film scholars, and it has recently been addressed by analytic and continental strands of film theory. 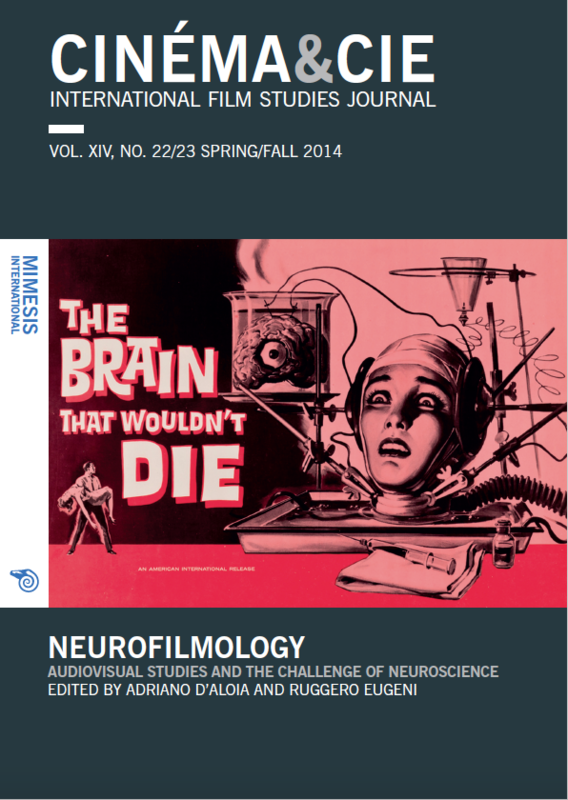 As neuroscience is well equipped to offer insights into cinematic emotional experience, a stimulating dialogue between film studies and neuroscience has been engaged. The present article proposes that an affective neuroscience approach may constitute a valuable framework for empirical investigations of the qualities of cinematic emotional experience. In particular, affective neuroscience provides important theoretical insights and empirical evidence for the study of the subjective dimension of emotional experience from a naturalistic point of view. Current psychocinematic research aims to investigate film experience by focusing on the connections between brain processes and mental events. The agenda of the psychocinematic theorists may be expanded by integrating third-person observations of neural activities with first-person methods that take into account the experience of mental phenomena. In this framework, brain studies on the experiential self are relevant for the investigation of the subjective character of the emotional experience of film. This article provides an embodied account of conceptual meaning in film. More specifically, it claims that the sensory-motor system plays a constitutive role in the cinematic characterisation of abstract concepts. Firstly, we briefly discuss the standard disembodied view of first-generation cognitive science according to which the mental representations of concepts are primarily symbolic and abstract. Secondly, we argue against this view by discussing an embodied theory of concepts based on recent neuroscientific evidence and results from cognitive linguistics. Lastly, we consider the implications of the latter for the study of visual representations of abstract conceptual meaning in film. Using Stanley Kubrick’s 2001: A Space Odyssey (1968) and Eyes Wide Shut (1999) as examples, we make the case that sensory-motor structures play a crucial role in the representation of abstract concepts in cinema. Film narratives are intrinsically time-dependent designs. This article proposes a model of narrative nowness, based on Husserl’s concepts of retention and protention on one hand, and Francisco Varela’s neurophenomenological exploration of time consciousness on the other, relating this further to narrative experience and its neural epiphenomena. Only recently has brain research been equipped with the possibility of dealing with temporal frames relevant for time consciousness in the scope of whole narratives. The study of cinema using neuroscientific methods and insights is referred to as neurocinematics. We promote neurocinematics as a complementary method of traditional film research, rather than an approach of brain sciences in general. Neurocinematic methods may provide film studies with new tools for re-evaluating established filmmaking conventions and developing new ways to study, for instance, the film viewer’s experience and related aspects of time consciousness. Camera movements are considered a key element for the intersubjective relation between viewer and screen; nonetheless, their concrete effect on spectators’ experience still lacks the attention it deserves. This paper promotes an embodied approach to the study of camera movements, aiming to better understand the role of motor cognition during the film experience by analyzing the effects of camera movements on viewers’ motor cortex activation. We present an empirical high-density EEG neuroscientific study on camera movements, investigating viewers’ brain motor responses to different techniques like zooming, and the use of a dolly and steadicam. This is triggered by the idea that each movement implies a particular form of physical relation between the audience and the movie. Indeed the experiment showed that the Steadicam determined the strongest activation in viewers’ motor cortex, providing first empirical ground to the notion of the capacity of the camera to simulate the virtual presence of the viewer inside the movie. This study shows how cognitive neuroscience can contribute to a better understanding of film style and techniques. Finally, this research demonstrates how film technique can be useful to cognitive neuroscience, by enabling the simulation of observers’ movements and, in so doing, allowing a novel approach to the study of action-perception links. The museum has always been open to virtuality, to mimesis, since the objects it collects are often images. But with the competition from modern spectacles, the museum was quickly confronted with a broader virtuality, that of immersion, which places the viewer not in front of the image, but in the image. Obviously, the immersive aesthetic is not ideally suited to the museum’s education, cultural and cultural mandate. The long and complex history of the relationship between the museum and cinema – which culminated in the “cinéma d’exposition” – clearly demonstrates this. The museum’s recent interest in mixed-reality games, which echoes the use of the Internet and video games by mass culture, has renewed this tension. We will test these hypotheses in examining Uncle Roy All Around You (2003), an exemplary game involving street-players and online players collaborating in the search for a mysterious missing person, which was designed by Blast Theory and which premiered at the Institute of Contemporary Arts in London. In 1990 Raymond Bellour defined the practice of film analysis as “an art without future” because of the intrinsically different language it used in relation to its object; specifically, he was referencing oral communication (seminars and teaching classes) and creation through visual arts as the only specific spaces left for film analysis. His idea was to overcome critical and theoretical writing in favour of an action on film. What is the relevance of these reflexions in the new media landscape? By envisioning a dialogue between new and old tools, one can reflect on the way digital devices are shaping emerging practices. If the viewer is becoming an actor, then perhaps the researcher is able to become an editor who – by deconstructing the film – can also produce new audio-visual and graphic material. Computer-assisted analysis involves a range of different tools, from statistics to annotation to presentation, and each tool has practical as well as methodological implications. In this article, I examine the conception, application, and potential of four such computer programmes from the perspective of the history of cinema and film analysis. I also hypothesize that active reading tools such as Advene, while helping to promote new practices, may also encourage new approaches. I argue that the computer amounts to a real assistance tool for the practice of analysis. Our desire to deconstruct and analyse films is today more alive than ever, and digital tools can help us not only to “grasp” the film, but also to grasp its impact on us, as well as the path to our comprehension of it. Recent years attest to a significant change in the representational practices of film historiography. As a consequence of digitization, visual display formats occupy a more prominent role in scholarly and museum practices as means for contemplating the historicity of archival film. This development prompts a discussion of how we might appreciate digital formats as “visual secondary sources” which reproduce and recast historical tropes. To address this discussion the article proposes a combination of institutional and medium specific analysis as a framework for analysing this transition’s consequences. The permanent Panorama (2012) installation at EYE Film Institute Netherlands – a multiple-screen installation which offers a panoramic vision of film history using video excerpts from EYE’s digital collection – constitutes the article’s core example. The article analyses how the installation’s arrangement as a panorama situates the excerpts within two different film histories. First, the analysis attends to how the installation’s taxonomy suggests a connection to former deputy director Eric de Kuyper’s philosophy of film history and emphasis on cinema’s intermediality. Second, it considers the installation in relation to classic, cinephile conceptions of panoramic vision. Conclusively the article provides some brief remarks on how the analysis’ findings might help us further our discussion of visual display formats as visual secondary sources. The contribution deals with the contemporary production of neorealist films and photo-romances, a kind of illustrated magazine deploying sentimental narratives through drawings, or mostly stills. Both products were genuinely Italian and marked the country’s post-war culture. Whereas the first was advocated as highbrow art and the most remarkable expression of the nation in times of hardship, the latter has been disregarded as cheap popular culture; just in recent times it received the attention that a mass phenomenon deserves. What has been overlooked or only briefly discussed are shared areas between the two. The article tackles three issues: how neorealism partook in and merged into post-war visual culture, to the point that some thresholds and boundaries between highbrow, politically conscious and aesthetically experimental films and formulaic cultural products are hard to detect; the role of intertextuality in this process; and what happened in the transformation that occurred along the passage from the screen to the magazine, by comparing the function narratives had in novelization and in films.